Self-development is about investing in yourself; building your skills, knowledge, and experience. It encourages you to be proactive, set yourself objectives, and commit to pursuing those objectives. 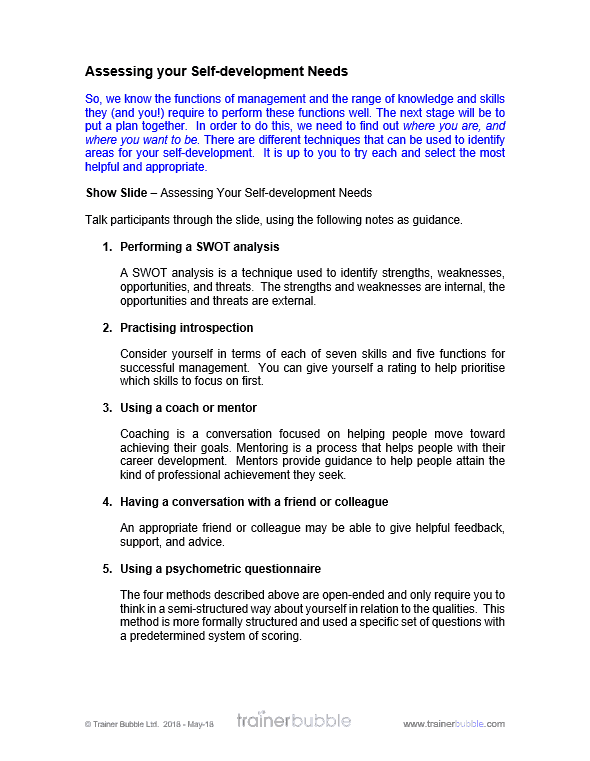 These ‘Self Development for Managers’ training course materials are suitable for managers that wish to continuously develop their skills and improve their abilities as a manager. Effective managers are those that take ownership of their personal development and are able to set goals and targets that will improve their competence and ability to exceed in the role. This training course will help your managers focus on learning opportunities, giving them a clear idea of where they are now and where they want to be in the future. It will help encourage managers to see their own development as a life long commitment to improvement through formal and informal learning activities. The main is to help managers improve their knowledge, skills and awareness, and help them develop talents and potential. 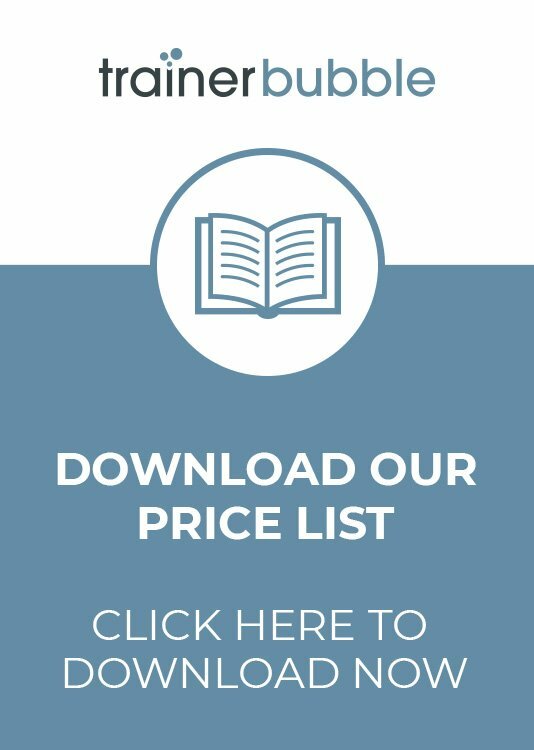 These training course materials provide everything required to help your managers focus on personal development. Helping them to enhance their skills and become better leaders. Self-development is about investing in yourself; building your skills, knowledge, and experience. It encourages you to be proactive, set yourself objectives, and commit to pursuing those objectives. 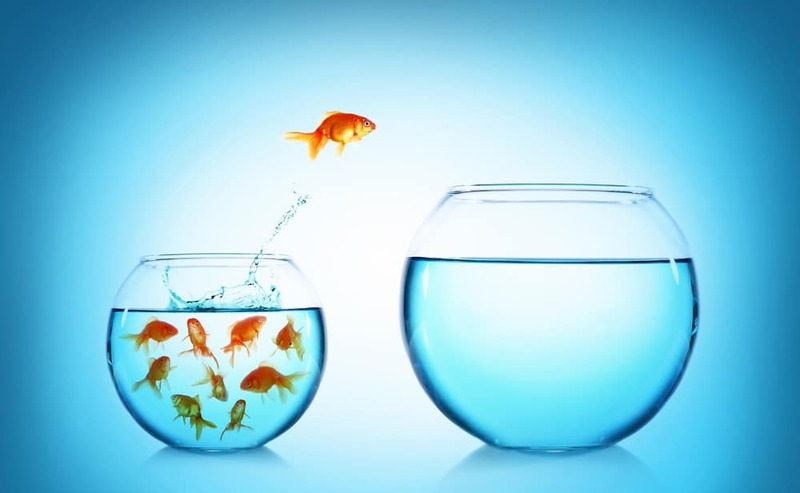 With these training course materials, ‘Self-development for Managers’, we focus on personal and career development to help your participants determine, set, and achieve their own objectives, and the goals and objectives of your organisation. 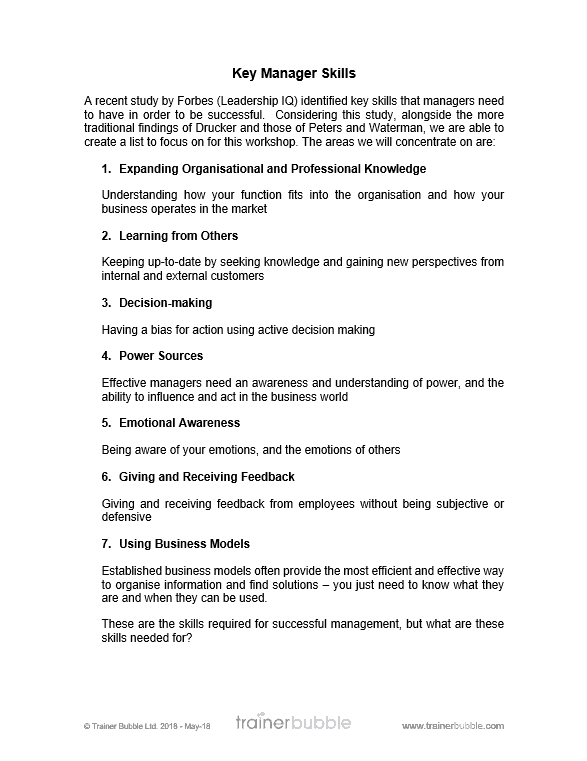 The training explores the skills and competencies required of highly effective managers. It includes diagnostic tests, sets out personal goals and objectives, and allows participants to complete a variety of activities to develop their skills and abilities. 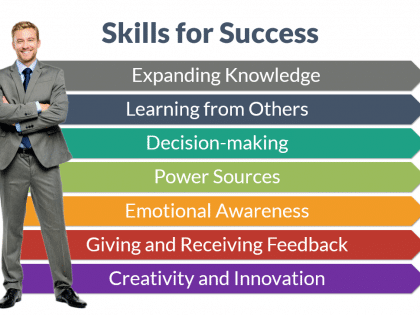 These Self Development for Managers training course materials aim to give your participants the tools and techniques they require to become successful in their role. Helping them to develop their personal skills and abilities and thus helping to secure the success of your organisation. Introduction, Objectives and Expectations – An introduction to the subject, an opportunity to review the course objectives and identify any personal objectives and expectations of the group. Includes a review of participants personal learning experiences. The Philosophy of Self-Development – Understanding the philosophy of self-development and the importance of seeing it as an opportunity for continuous development. 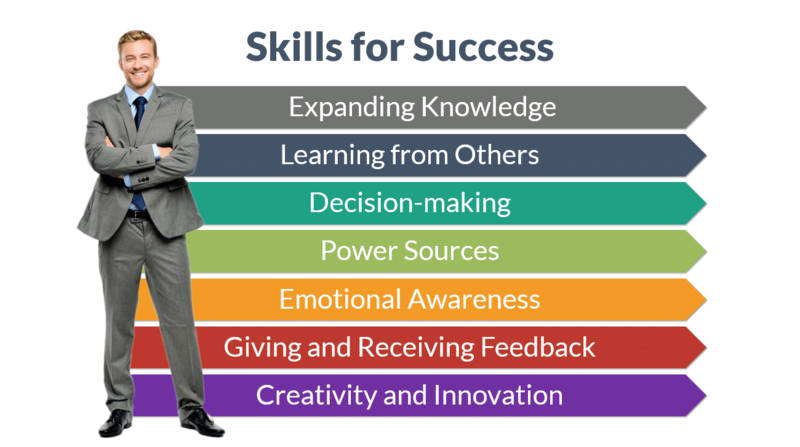 Skills for Successful Management – Exploring the key skills that successful managers possess. 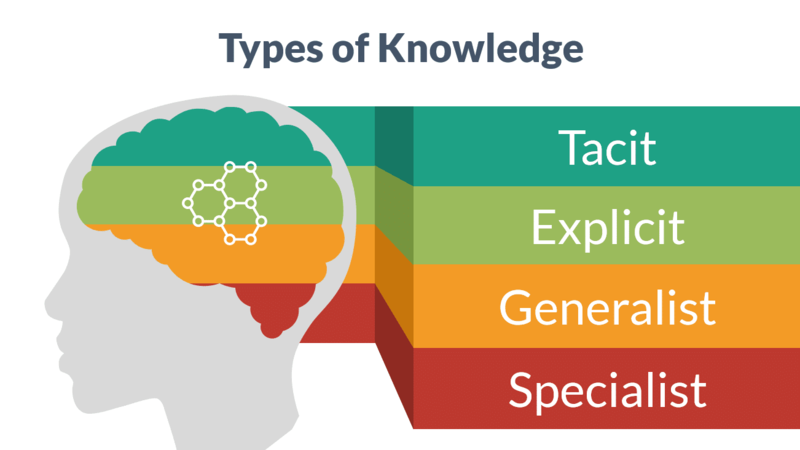 Identifying what managers actually do and the main functions of their role and then breaking this down into key tasks and the knowledge and skills that must be developed to be able to meet these tasks. 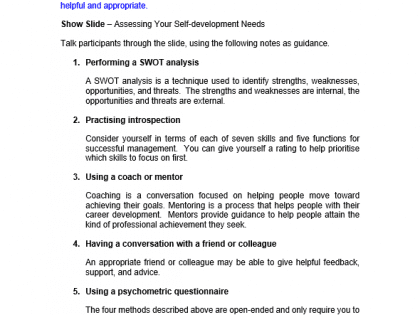 Assessing Your Self-Development Needs – Establishing where they are and where they want to be. 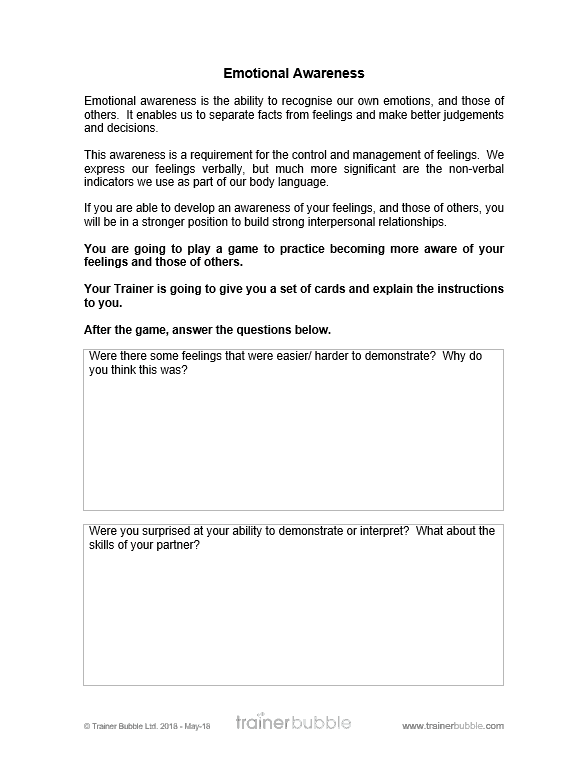 Using a series of tools to identify areas for self-development. Includes practice and review. 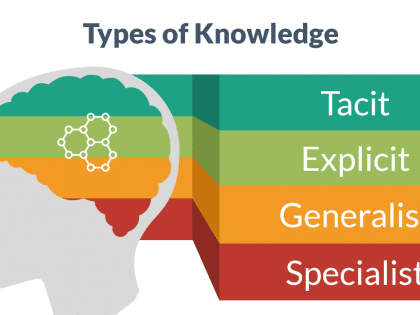 Expanding Your Knowledge – Reviewing the difference between organisational knowledge and professional knowledge and the four sub-categories of each (Tacit, Explicit, Generalist, Specialist). Exploring ways of expanding this knowledge. Learning from Others – Identifying key people that can help support participants with their learning. Decision Making – One of the most important skills of a manager, this session helps provide participants with a process for decision making that they can apply to their personal requirements. 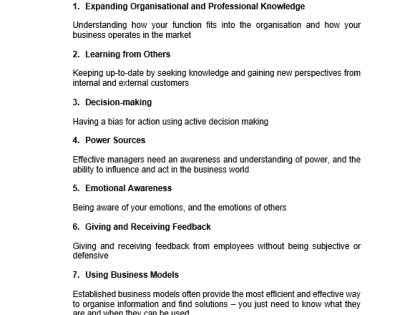 Power Sources – Identifying the different power sources within the business and how this impacts them personally. 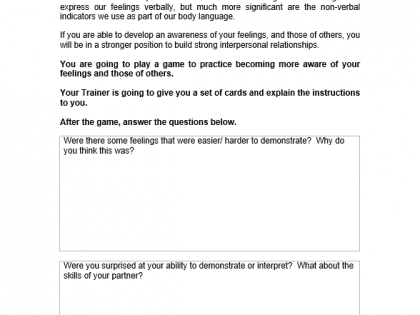 Emotional Awareness – Practicing being more aware of personal feelings and those of others. Putting the participants in a stronger position to build interpersonal relationships. Giving and Receiving Feedback – Good feedback skills will help managers do their job more effectively. 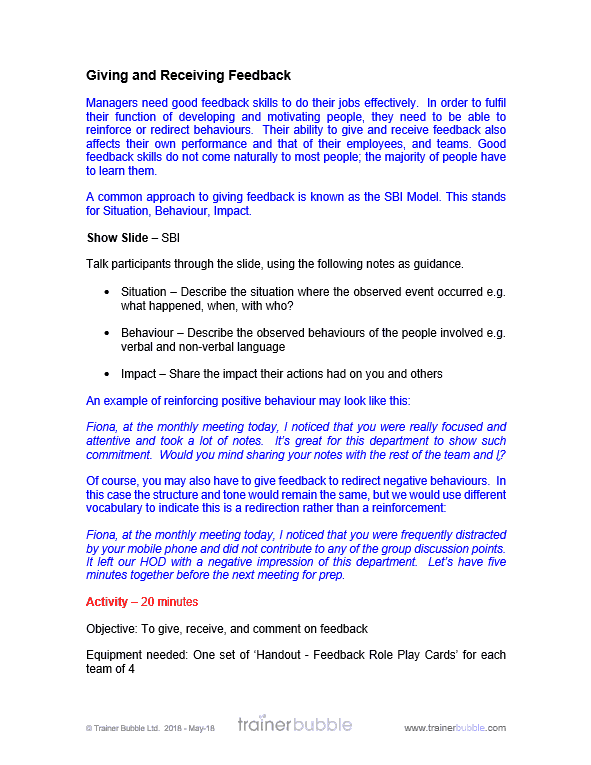 Exploring a common approach to giving feedback – the SBI Model. This stands for Situation, Behaviour, Impact. Business Models – Reviewing a series of common business models used to develop personal skills and those of our employees. Setting Goals for Development – Creating areas for personal development and setting clear goals for self-improvement towards them. Summary and Action Planning – Reinforcing the learning by creating actions for the workplace and further development. 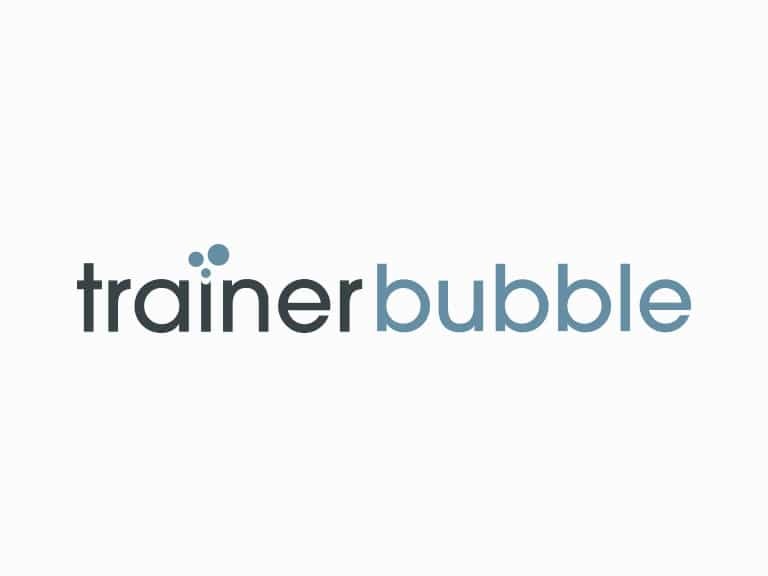 As with all Trainer Bubble training course materials, this training is highly interactive and includes activities and exercises throughout.